Maruti Suzuki India Limited (MSIL) recently launched the facelifted Ciaz with much anticipation and it has lived up to its hype thus far. The Indo-Japanese manufacturer has made several changes inside and out to the C-segment sedan to ensure positive response received among customers. It can be booked for Rs. 11,000 across Nexa dealerships present in the country and is priced between Rs. 8.19 lakh for the entry-level Sigma petrol, and it goes up to Rs. 10.97 lakh (ex-showroom) for the top-spec Alpha petrol and diesel trims respectively. The newly developed 1.5-litre, K15B, four-cylinder mill uses Suzuki’s mild-hybrid technology and is the major highlight in the facelifted model. The power plant will also make its presence felt in the upcoming new generation Ertiga and gradually on other models as well including S-Cross and Vitara Brezza expectedly. In the Ciaz, the more powerful unit is opted in place of the regular 1.4-litre petrol engine and develops 104.7 PS at 6,000 rpm and 138 Nm of peak torque at 4,400 rpm. It is mated to a five-speed manual as standard or a four-speed automatic transmission as option. Maruti Suzuki continues its 1.3-litre DDiS 200 mill in the Ciaz though and it kicks out 90 PS at 4,000 rpm and 200 Nm at 1,750 rpm with claimed fuel efficiency of 28.09 kmpl. 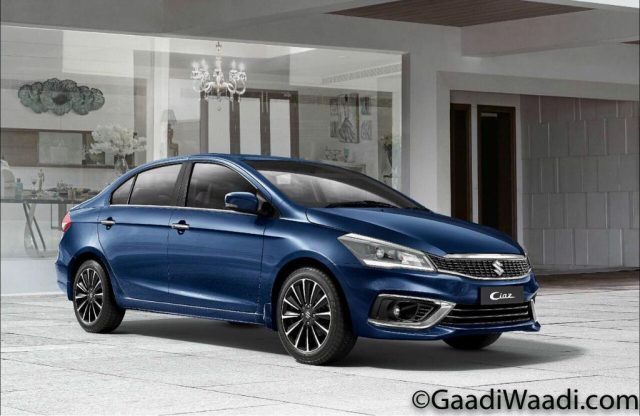 The company sells just four variants of the diesel Ciaz in India currently and is expected to get a brand new 1.5-litre diesel engine by the end of this year. The leading automaker in the country has long been mooted to gain a bigger diesel powertrain and we appear to have spotted the test mule hiding the upcoming engine. In comparison, although being fuel efficient, the existing 1.3-litre unit is underpowered against Honda City’s 1.5-litre i-DTEC engine producing 100 PS and 200 Nm of torque. It is the same case with Hyundai Verna’s 1.6-litre U2 CRDi engine making 123 PS and a massive 260 Nm. on the other hand, the Volkswagen Vento and Skoda Rapid pump out 110 PS and 250 Nm from the 1.5-litre TDI diesel engine. The upcoming oil-burner in the Ciaz will likely be more powerful than the outgoing version while having good level of mileage.